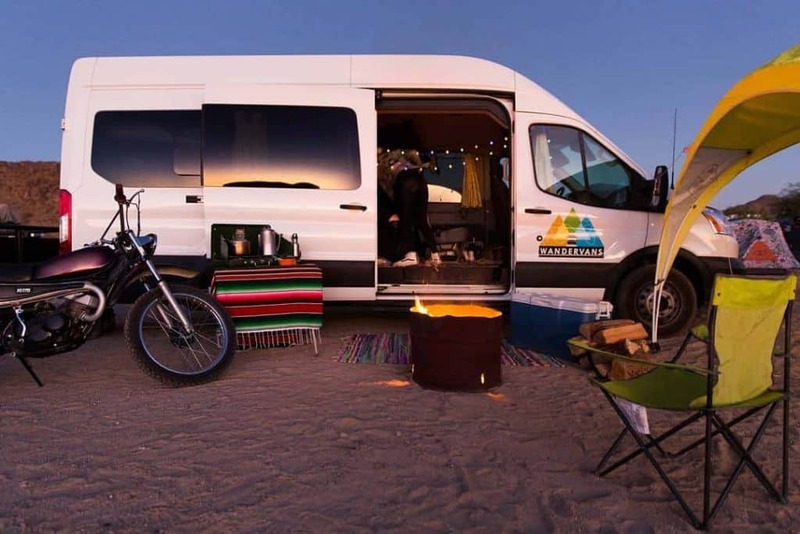 If you think van life looks like a lot of fun, but aren’t quite ready to buy your own camper van, you might want to try out one of these campervan rental companies. This way, you can try out a variety of vans before committing to a particular make, model or build. These camper van rentals range from Sprinter vans, to Ford Transits, to Nissan NV 200s, to Sportsmobiles, to vintage VW surfer vans. When you rent a campervan, you can also see which components you like the best if you ever do a van conversion yourself, like hot water, shower, solar panels, etc. 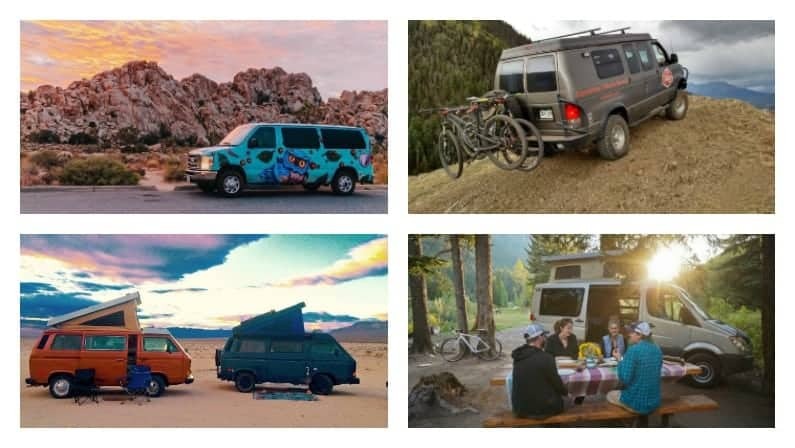 It’s amazing how many of these campervan rental companies are popping across the United States, responding to this van life trend. Here are some of the top campervan rental companies across the United States. Escape campervans is a campervan rental company with 12 locations across the United States. 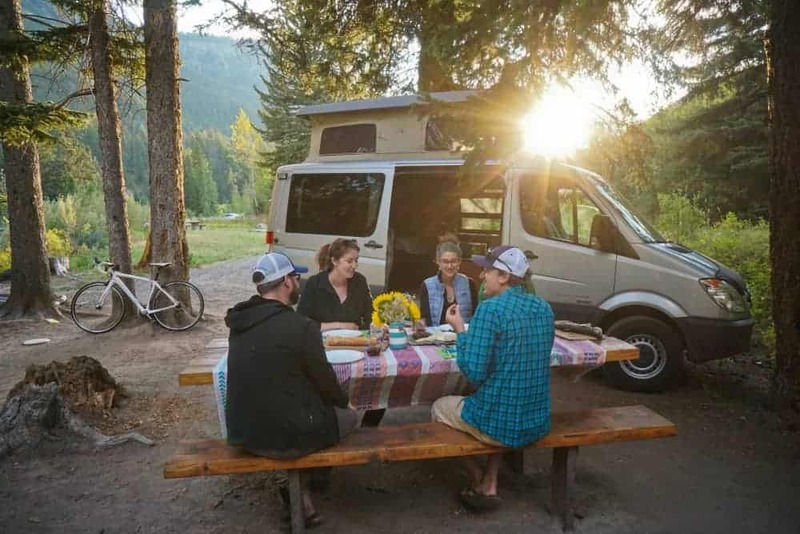 They have four campervan models you can choose from, the Ford E-150, the Dodge Caravan, the Ford-150 pickup camper and the Ford Transit Connect. 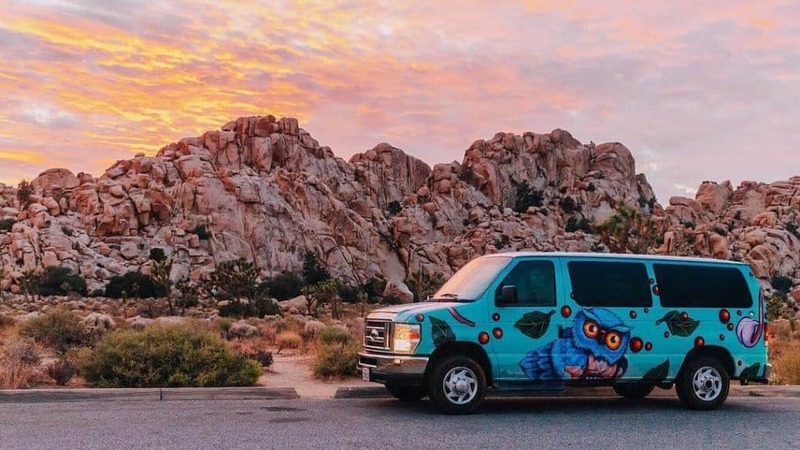 All 600 camping vans are hand-painted by artists in Los Angeles in bright, vivid colors, so renting this van and going stealth is a no-no. Every van comes fully stocked with bedding, a 2-burner stove, a sink with running water, refrigerator, cooking and eating utensils and picnic chairs. 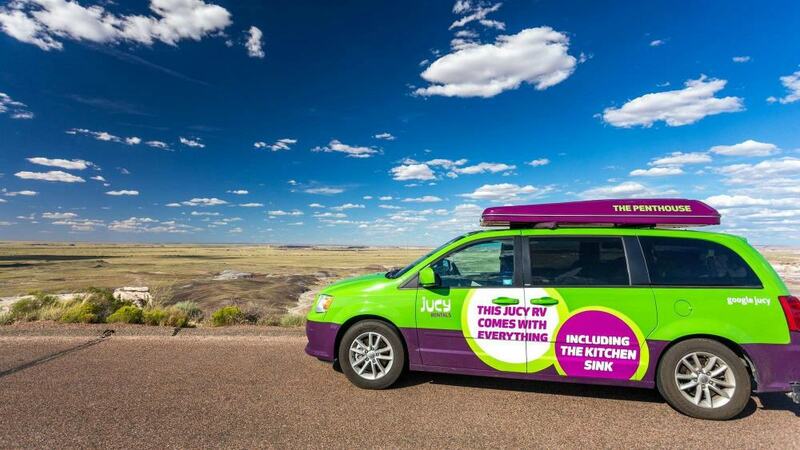 This is one of the biggest campervan companies in the U.S. – you can rent one on one side of the country and drive it to the other! Locations: Los Angeles, Las Vegas, San Francisco, Seattle, Vancouver, Phoenix, Denver, Atlanta, New York, Miami, Portland and Alberta, Canada. Rates: The rates are not published online as they are constantly changing depending on the time of year and where you rent your van. They start at $37 in the low season. 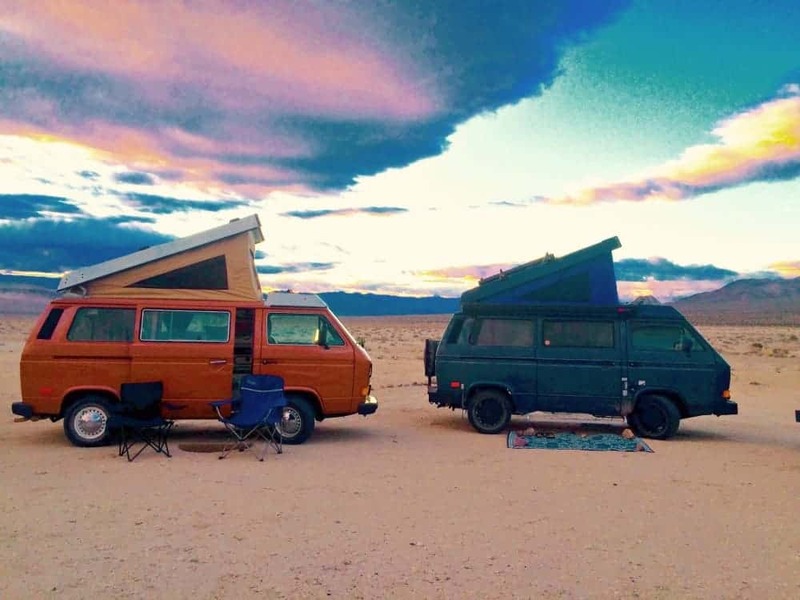 Outdoorsy has so many campervans for rent it will blow your mind. 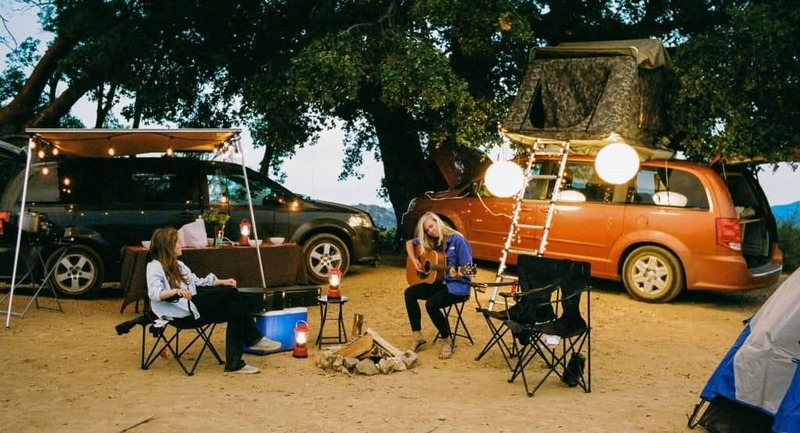 Based in San Francisco, Outdoorsy is one of the first rental companies out there that allows van owners to put their beloved vehicle up for rent. You can find all sorts of camper vans here, from the most basic build-outs to more luxury Mercedes Sprinter vans. 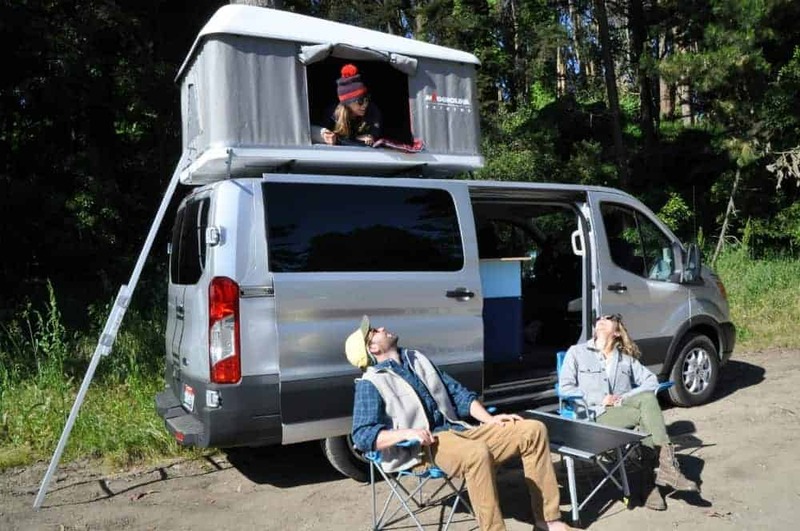 A quick search in the San Francisco Bay area shows an E350 campervan, an Overlander camper with a roof tent, a Sprinter van, and an old VW camper. 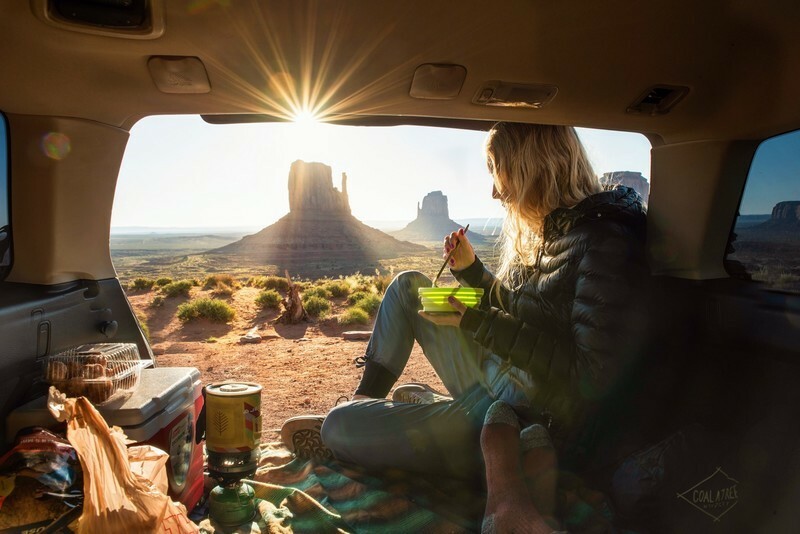 If you’re not sure which van to buy for van life, Outdoorsy is a great place to explore various sizes and types of vans. Outdoorsy has many price points and types of camper vans and RVs, and vans are available all across the United States. Another perk is that you can also explore camper rentals by city. Outdoorsy is offering a special deal for Wayward Home readers. Enter the coupon code “wayward40” to get $40 off your rental! Browse camper van rentals at Outdoorsy here. Locations: All over the U.S. This is a workhorse of a camper rental company, which locations spanning the globe and a wide range of vehicles to choose from. 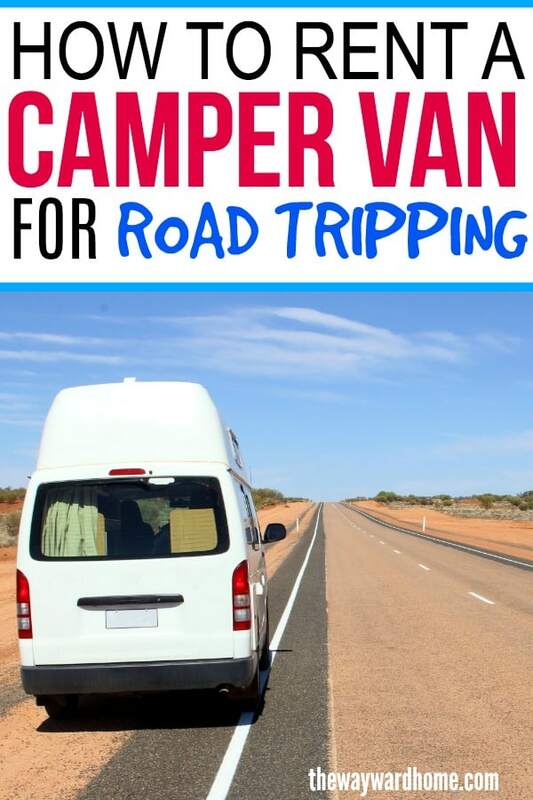 Not only are there campervan rentals here, there are RV rentals as well, so something for any budget. Camper Travel, USA partners with campervan and RV rental companies and is able to display vans from a wide variety of companies. This provides you a one-stop shop where you can compare rigs and prices. This might be one of the best companies to rent from as you can see vans and RVs in many locations at a wide variety of price points. Jucy USA started out in Auckland, New Zealand and recently brought its campervans to the United States. Their signature green-and-purple vans come in two types, the Jucy Trailblazer and the Jucy Wavefarer. Both are standard minivans, but the Trailblazer comes with a pop-up that can sleep an additional two people. The vans come with a gas stove, fridge, sink, water tanks and storage space. Rates: Vary, but a quick search on Jucy.com showed a range between $45-50 per day. Lost Campers USA is a budget van rental company which prices campervans similar to car rentals. You can get a camping van here for just $30 per day if you book at the right time of year. These vans are the way to go if you want to do stealth camping, as they have no art or signage. The vans come with a mattress and bedding, storage area, side awning, kitchen utensils, propane stove, ice cooler and picnic table with two chairs. Rates: The rates do change on a regular basis, but I’ve seen them as low as $30 per day. Venture vans are only available to rent out of Jackson, Wyoming, but with all the national parks around there like the Grand Tetons and Yellowstone, it’s worth the trip to rent a campervan for a few days. These are luxury Sprinter camping vans with an 8-foot tall ceiling, sink, refrigerator, two-burner range, outdoor shower, toilet and pop-top, which can become one of two full-sized beds. The vans also come completely outfitted with linens, kitchenware and camping gear. Wandervans are available in three different sizes: small, medium and large. The large van can sleep four people, and the medium and smalls sleep two. 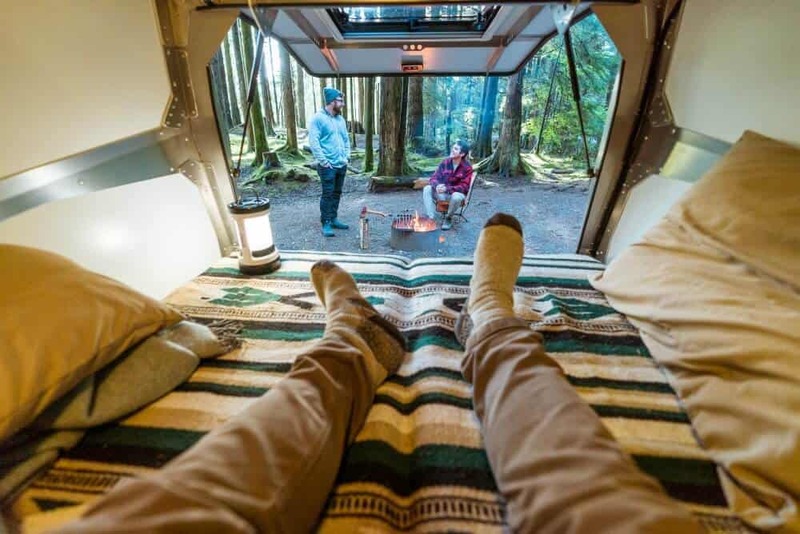 The company started in Boise and wants to help people get away from city life and wander around in the outdoors, and say their vans are somewhere between sleeping on the ground and renting a cumbersome RV. These campervan rentals are really cute inside, and if you fall in love, the company also offers full van conversions. The vans come with everything you’ll need for a trip in the wild outdoors, from kitchens to bedding. COUPON: Enter WAYWARD upon checkout to get 5% off. If your dream is to head out in a vintage van a la 1970s surfer, this campervan rental company is right for you. Vintage Surfari Wagons rents out a variety of nostalgic campers, from a Vanagon, to an Eurovan, to the good old Volkswagon camper van. These are super cute, refurbished campers that will let you live out your van life surfer dreams. 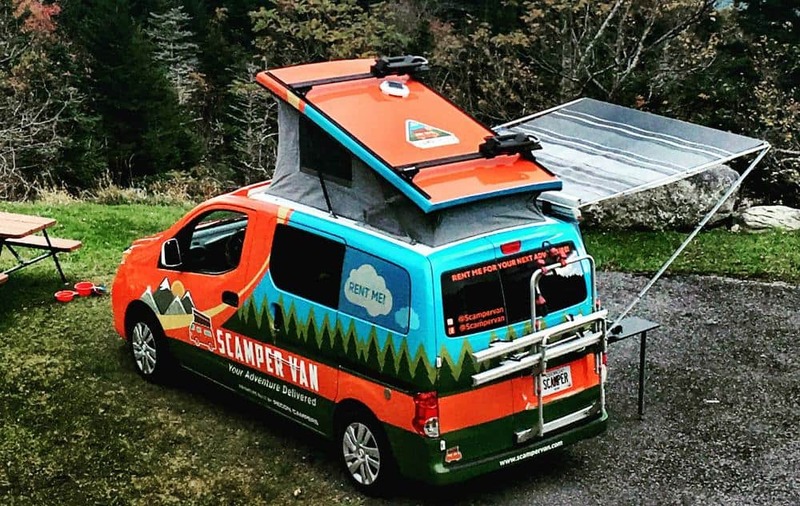 If you haven’t seen a Nissan NV 200 camper van, now is your chance. I just love how these compact cargo vans are small and get awesome gas mileage (25-30mpg) while also having the space to build into a camper. There’s a pop-top roof that can be made into a bed or simply to provide standing room when you’re working over the stove. Scampervans are decked out inside with a Mexican fiesta theme, can sleep up to four people. If you need a super serious camping van for off-road and boondocking adventures, then you might want to check out Tonto Trails campervan rentals. They specialize in off-road luxury vehicles the Sportsmobile 4×4 rental and the Tiger, which is an RV based on a 4×4 Chevy 1-ton chassis. These vans can plow through water, go over rocks, and bump along uneven terrain. Truly looks like fun for exploring the mountains of Colorado. 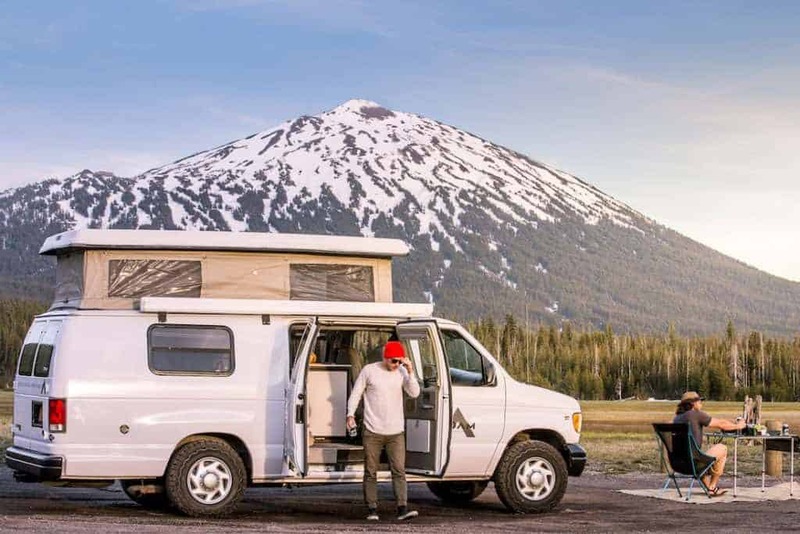 This recreational Ford Econoline Sportsmobile campervan rental company Roamerica Rentals will rent you a van ready for any type of weather conditions in the Pacific Northwest. 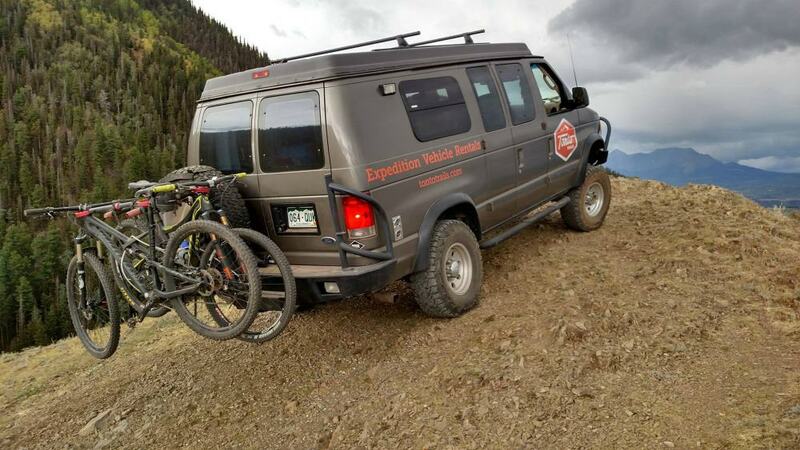 These vans have racks to carry bikes, snowboards, skis, fishing poles, anything you might need for an outdoor adventure. The vans can sleep four and are fully equipped with a full kitchen, camp gear and linens. The minimum rental for these vans is three days and sleep up to five people. The company just launched summer of 2017, and hopes to help people explore the amazing national parks in California. Lots of people are interested in this type of travel have pets. Do you know if any of these companies allow people to rent them with pets? Hey Pamela! I’m not sure. I think you’d have to check with the individual rental companies to find out. Hey Pamela — Just saw your question. I am the owner of Outervan, a handcrafted campervan rental company based in the Bay Area. We love pets and their welcome to roll with you. Thanks for all the energy you put into researching this!!! So helpful and will be bookmarked on my computer! Lindsey, I just checked out your site. Looks amazing. Really beautifully designed vehicles. You can tell a lot of heart and thought was put in to your company. I hope to use the service one day soon. Wife and I are looking to do at least one or 2 of these types of trips per year. Y’all are booked up for the time frame we’re looking for, but we’ll take a look for sure when the next trip is coming up. Great article….BUT I am dying for Lost Campers USA or someone like them to be in the WDC -MD -VA area…..so far there is nothing. HELP any ideas??? We have lots of camping areas here and for sure I want to rent/drive a Camper Van before I decide to buy. Hey Teresa! You can always try Outdoorsy, which has locations all over the U.S. Have you checked them out yet? Do not forget to check Ondevan Campervan (https://ondevancampervan.com/) if you to FLorida.